Tuesday – a restful sleep which sets us up for a great day. Our air conditioner did its job and we are, after our showers, refreshed and rearing to go, that is until we open the door and discover the humidity is heading for the heights again! Downstairs for breakfast in the little elegant dining room. Juice, cereals, danish pastries, croissants, toast and the ever popular strong coffee. Thank heaven for the coffee which is wonderful and just the thing needed to get us motivated for today’s sightseeing. 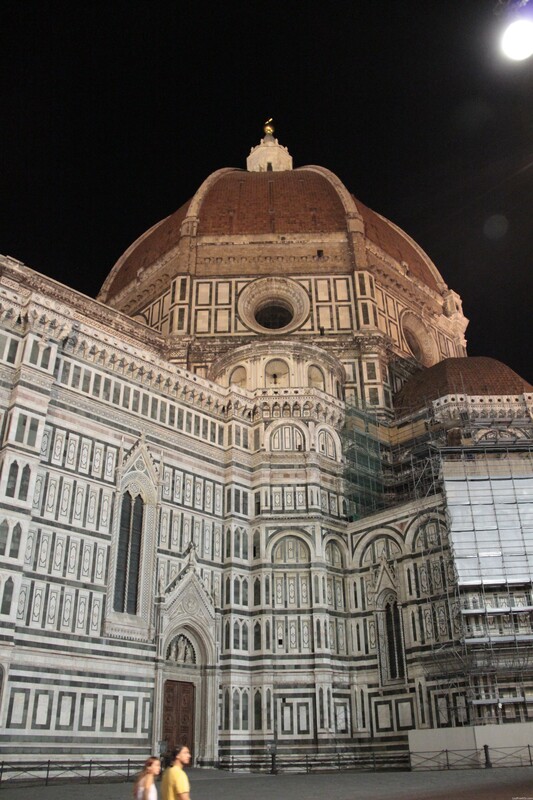 We have a few hours before we get our train to Florence and looking at the itinerary there are a few things on the ‘to do’ list – Campo Ghetto Nuovo, Fondamenta dei Mori, Campo dei Gesuiti, Santa Maria dei Miracoli, Statue of Colleoni and Campo San Polo. Did I say a few things? Just a bit understated like always. 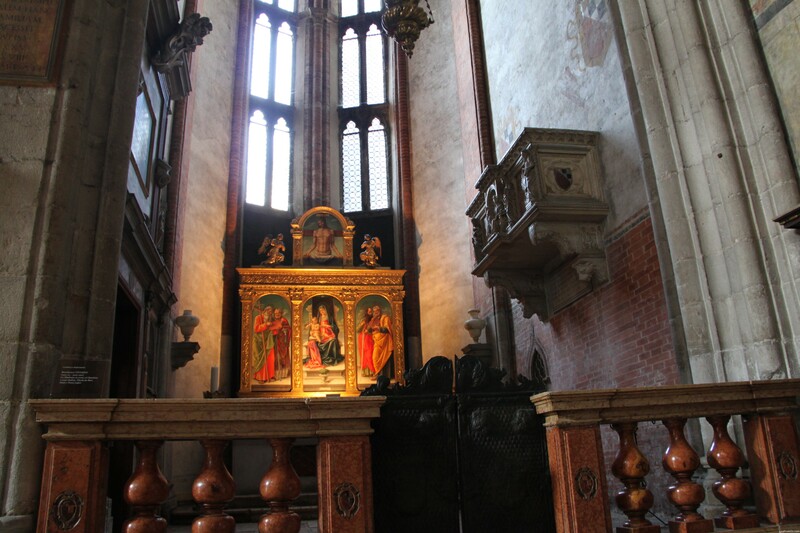 As with our itineraries we decide that we will totally ignore today’s list and visit Santa Maria Gloriosa dei Frari (which was on the list for yesterday). 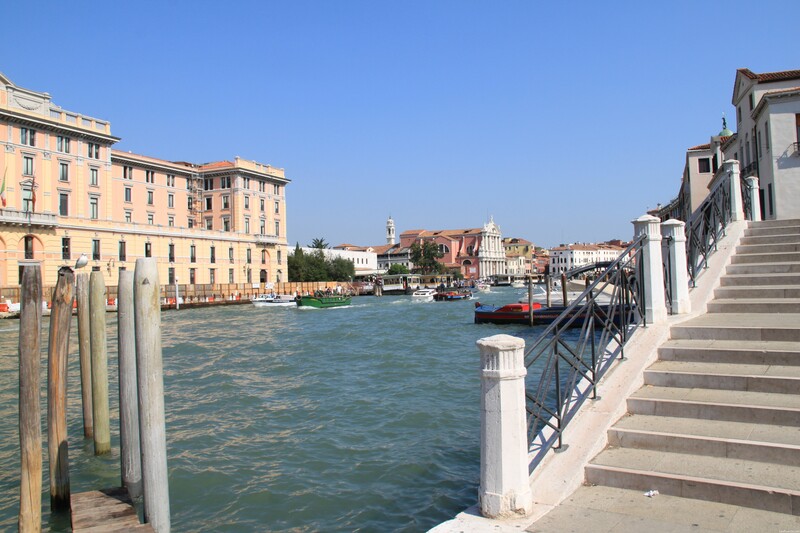 This is virtually close to the hotel and the railway station even though we have to cross the Grand Canal but that is OK plus we will also get to explore a few of the little streets and alleyways along the way. Heaven knows what we will find. HISTORY LESSON : The church dedicated to Saint Roch was built between 1489 and 1508 by Bartolomeo Bon the Younger, but was substantially altered in 1725. 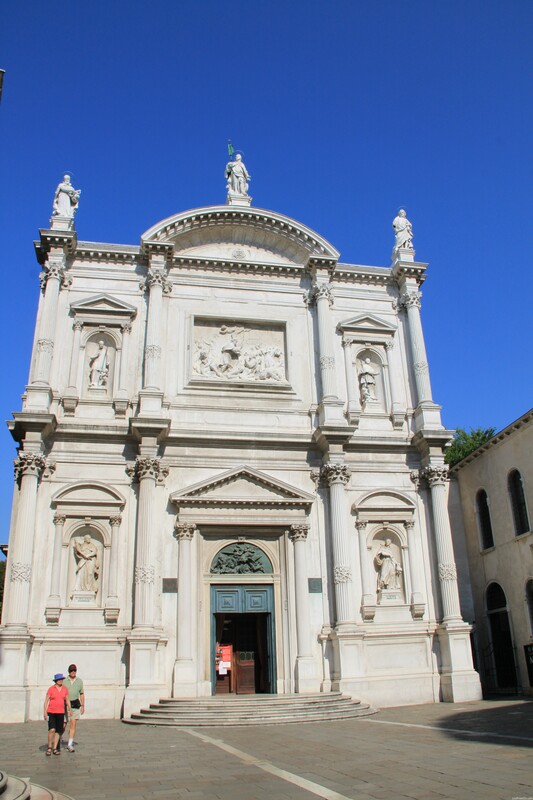 The façade dates from 1765 to 1771, and was designed by Bernardino Maccarucci. St. Roch, whose relics rest in the church after their transfer from Montpellier, was declared a patron saint of the city in 1576. 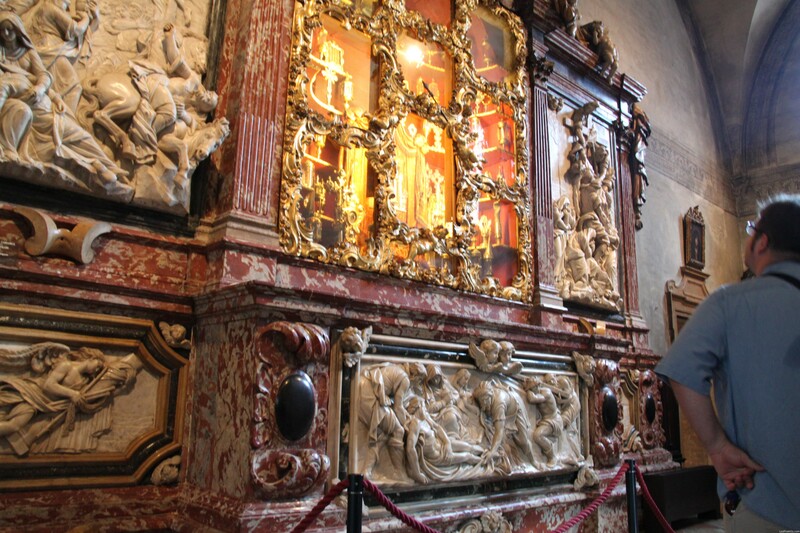 Every year, on his feast day (16 August), the Doge made a pilgrimage to the church. 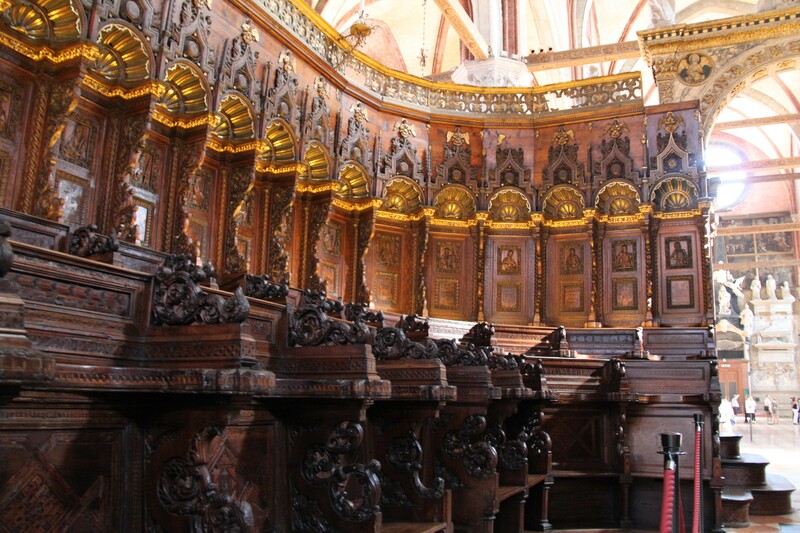 We do not go inside but press on to Dei Frari. 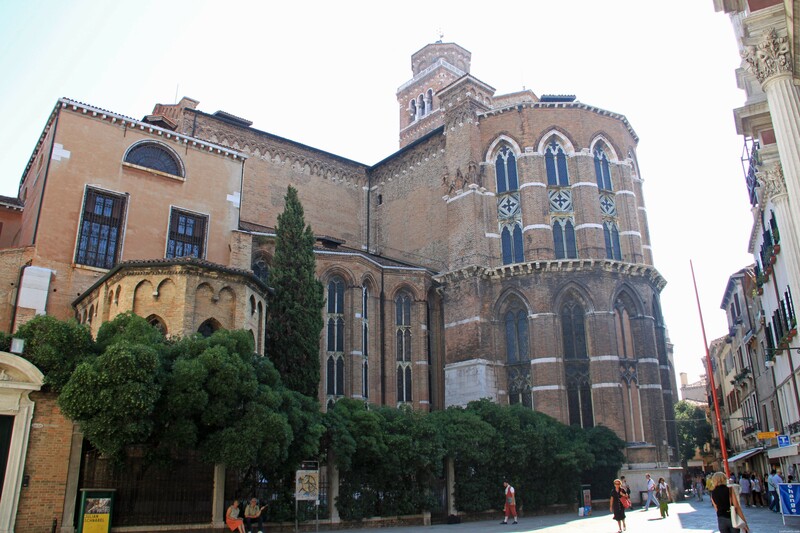 Winding our way through the streets we reach our objective – Santa Maria Gloriosa dei Frari. 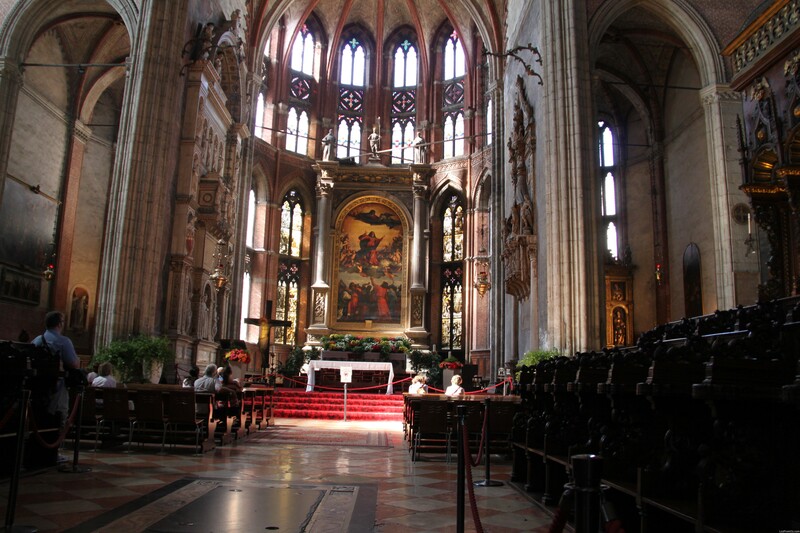 It is a large church so more photos and then we go to the entrance and pay the fee of 3 euro which I might add is a pittance for what we will see. We are hoping for a bit of respite from the heat and humidity but no luck. K&T do not handle heat and humidity very well and even though I do not mind the heat the humidity is knocking me for six. We go our separate ways and do our own thing – mine is taking photos. Bugger – ‘No photography’ signs – so time to improvise. Lucky for us there are not many people inside so we can walk quietly through at our own pace and enjoy the solitude. Another good thing is that there are no restoration works in progress. The artwork and carvings are incredible and to think that some of them were completed at least 500 years ago or more is amazing. I will not give a full length detailed description of every photo – just roll your mouse over to see what they are and then you can check through Wikipedia for more information. 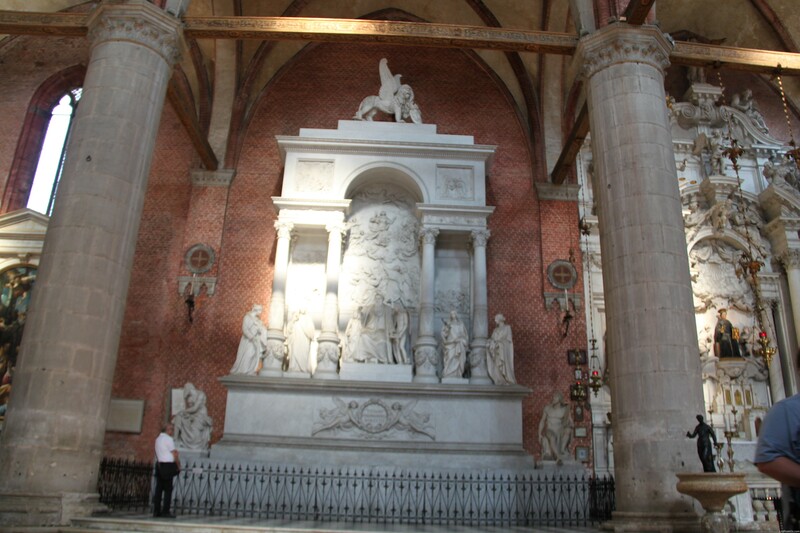 Below is the tomb of Titian which was finally erected in 1853 – just a bit late as he died in 1576! Titan is called the greatest Italian Renaissance painter of the Venetian school. Which makes me wonder why the monument over his tomb was not erected earlier. But it is there now so I suppose that is all that matters. After quite a lengthy visit we decide to walk back to the hotel and on our way pick up a couple of souvenirs. I am still after a Venetian mask and Kylie is after a piece of Venetian glassware. Lucky for us there are lots of little shops in the narrow streets along the way. I finally find a shop that I like and it advertises that all the masks are hand made on the premises – so in we go and have a look around. 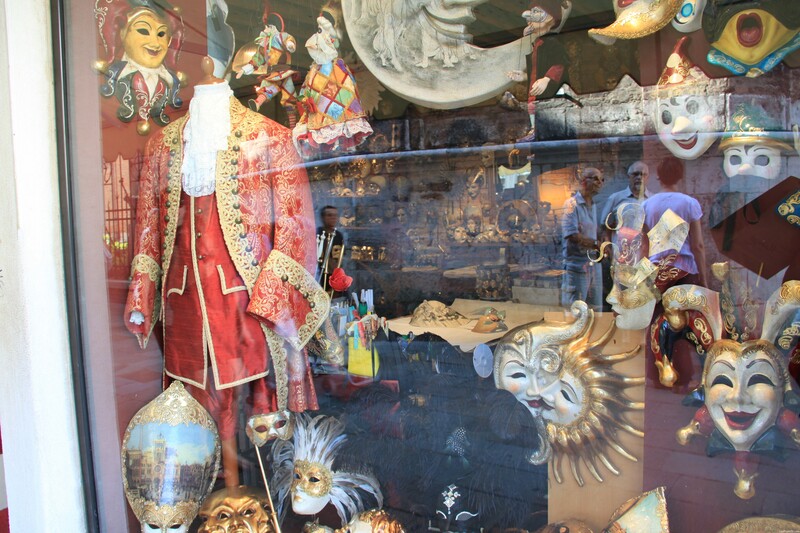 They have incredible costumes that are either hired out or sold to customers for the many Venetian parties. They also have some incredible masks especially ones made with lots of feathers which I really would like except for the fact that it would most probably get confiscated by the ever vigilant although somewhat inexperienced at times, Australian Quarantine service. The name of the shop is Atelier Marega. The service is great and the wonderful lady actually shows you how the masks are made. 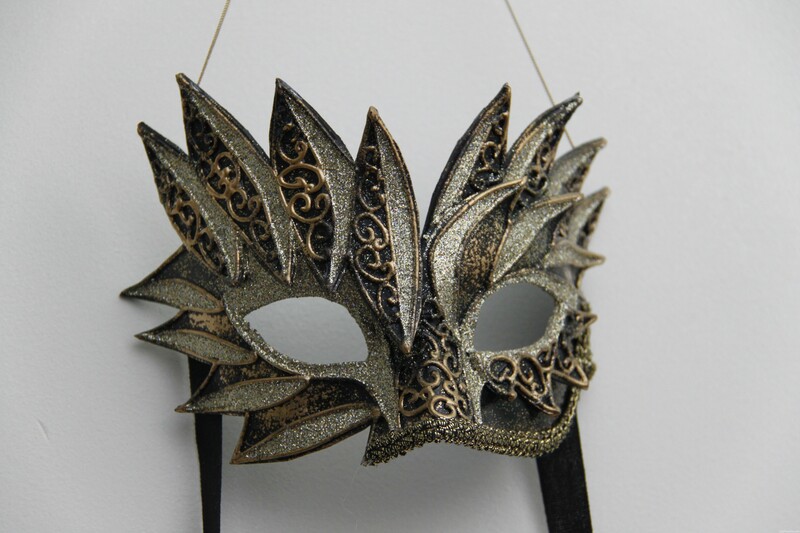 This is my mask – quite expensive but then we are in Venice and it is hand-made so it is only to be expected. We then move on to a place that has Venetian glass and Kylie gets a beautiful little gondola with gondolier. It is Venice to a T so to speak. Both our parcels are carefully wrapped for the long journey ahead – we are happy little vegemites so our trek back to the hotel continues. Also continuing is the ever increasing heat and humidity. 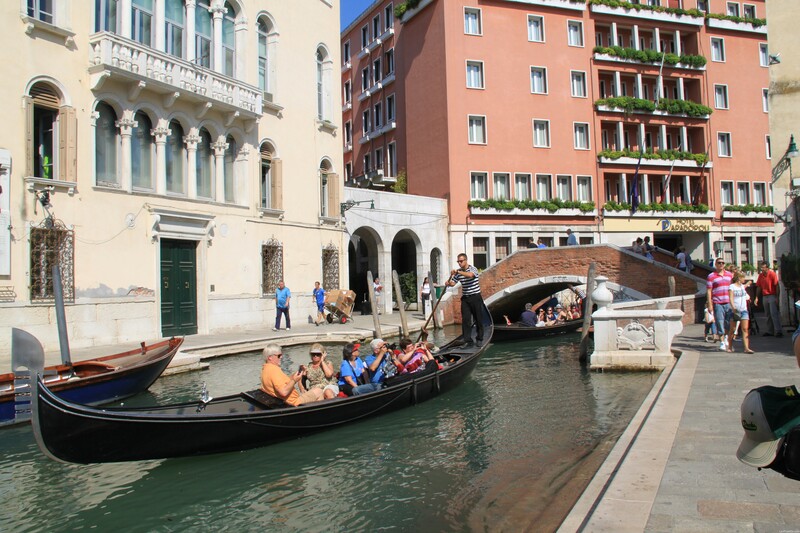 Hoping that we are going down the right streets we come across the Gondolier Groupies sitting out in the hot sun. The prices on these is around 80 euro for about 40 minutes and that is just during daylight hours. At night the prices increase to 100 euro and if you want to have the full hour you have to pay another 50 euro. The prices are set by the Gondolier’s Association so I suppose that’s a good thing. I would not like to pay 5 euro and then be found paddling like crazy in the middle of a canal. I would love to enjoy one of these rides by night in one of those majestic padded gondolas but unless I am guaranteed that the gondolier would be Placido Domingo (Pavarotti has gone to that big Opera Stage in the Sky) and he would sing O Sole Mio as we cruised along – then no soap. Many of the tour companies like Insight and Trafalgar have this ride included but just have a go at how they are packed in – oh crap! 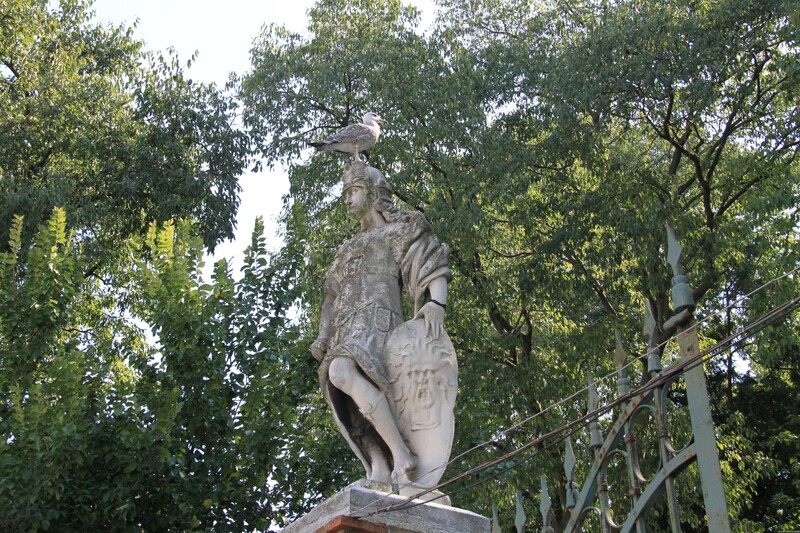 I always seem to manage a bird of some description landing on the head of a statue just when I am about to click. Still I think it gives the photo an added bit of character although I would hasten to presume that the person whom this statue represents would disagree with me. The shade offered by this park is very refreshing and when we arrive at the Canal we discover that we are, of course on the wrong side. But that doesn’t matter as there seems to be walkways along here and then we can cross over one of the little bridges that will take us back home. These are our last photos of Venice. There is a little bridge further down and then it’s just a short walk to our hotel and our belongings. 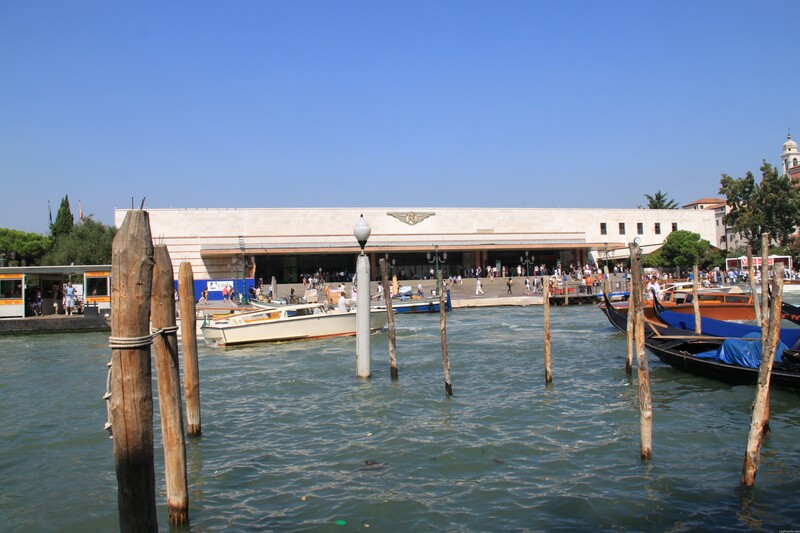 The photo on the left is the Grand Canal where we vaporetto’ed up and down a few times and the other is the Santa Maria Railway Station. We arrive back our hotel exhausted. We must have gone like the dickens this morning as it is only about 12.30pm and our train doesn’t leave until 4.30pm. We make a decision to go to the station and see if we can get on an earlier train as none of us wants to go back out into that humidity. We all agree that is a good plan so we sit in the hotel for a while – check the emails and internet and recompose ourselves. After all that is done we head to the station and Kylie is off finding out about exchanging our tickets for an earlier service. About half an hour or so later she arrives back looking very flustered – apparently it took her quite some time to find someone to help her and then she had to pay another 10 euro for each ticket that had to be changed. Now I know that Venice is expensive but this is really lousy on the part of the Italian Railroad System considering we had already paid for our tickets and our reservations and all we wanted was to get on an earlier train. We all just want to get on the train so off to the platform for our short wait. It is not long before our train arrives but we have to wait until the attendants go through and clean up before we can get on. The seats are comfortable and we are soon on our way to Firenze! As we are in First Class we are entitled to drinks and nibblies which are brought around by gracious attendants. These are most welcome as is the air conditioning. Our journey is about three and a half hours so we can relax. K&T have a double seat and I am in a single seat across the aisle. Kylie is soon asleep, Tyler is playing with his ipod and I am listing to my music as we travel along at 100 mph. It is not long before I am also having a Nana Nap. Arriving in Florence around 4pm we find our way out of the station – oh so many people – but no humidity. It is hot but not unpleasantly so and out comes our trusty map to find our accommodation Tourist House Ricci. We are greeted by a wonderful lad by the name of Frederico who is very polite and also very energetic and seems genuinely pleased to see us. 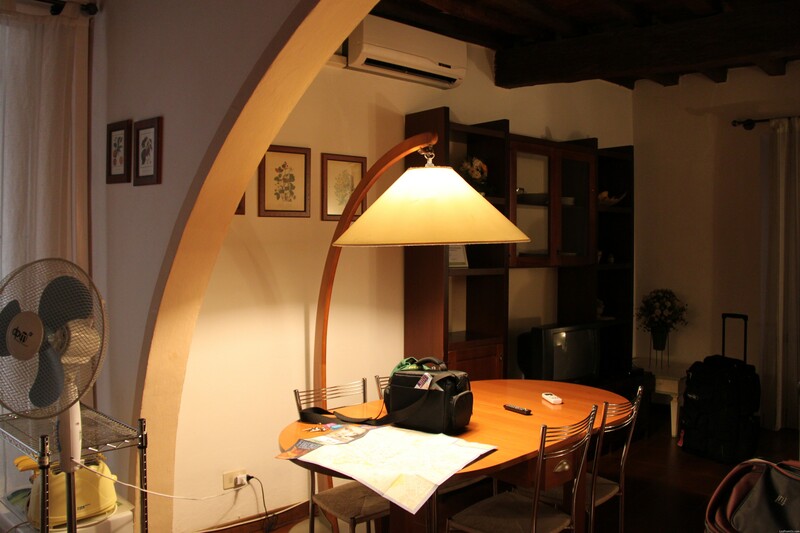 Alas our enthusiasm fails when he tells us that we are not staying at the guest house (holy crap memories of Prague) – we have been upgraded and will now be staying in an apartment which is about a five minute walk away and very, very close to the centre of Florence. 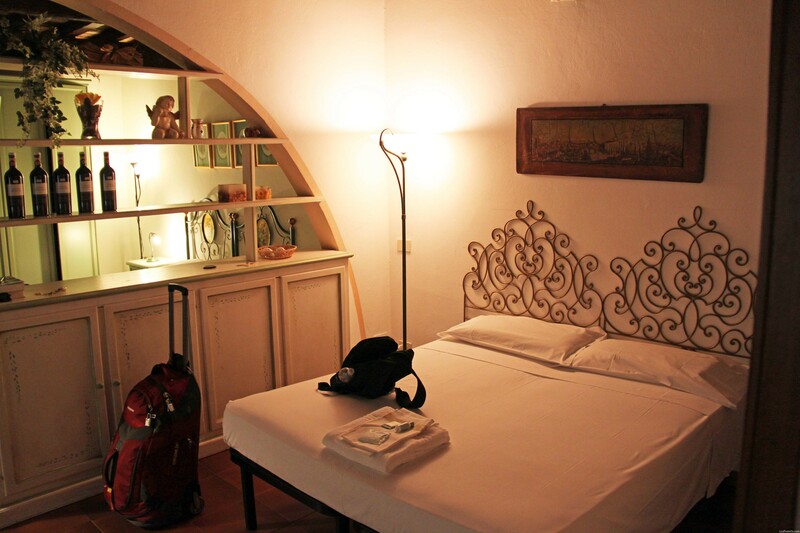 There is nothing we can do except smile – he takes our suitcases and we are soon on our way to the apartment. 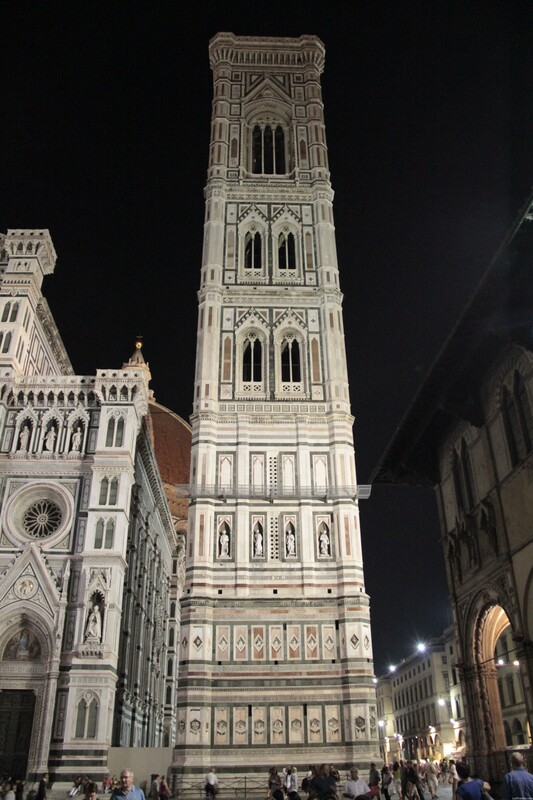 We pass the Duomo and Frederico keeps telling us not to worry – he has a big smile on his face – we are skeptical to say the least. Frederico keeps telling us about everything that is so wonderful in Florence and he is sure that we will have a great time. We cross the Piazza della Repubblica and all of a sudden we are here. 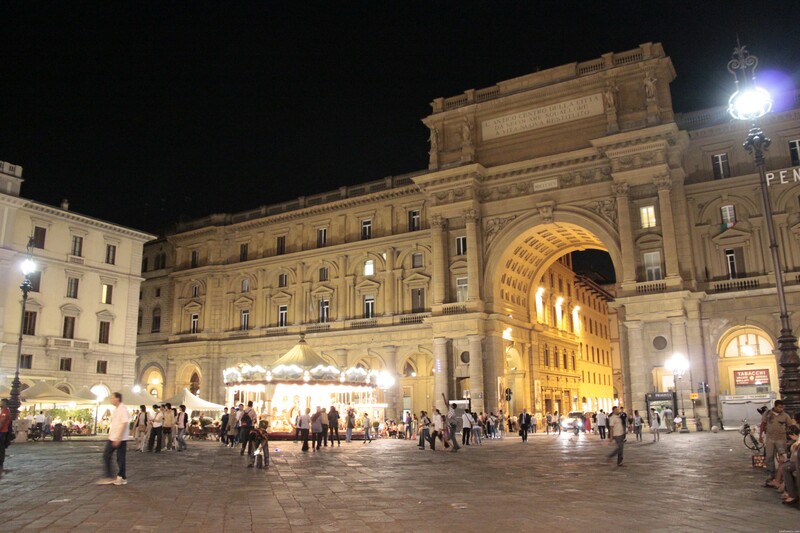 That’s right – our apartment is in one of the buildings on the Piazza and the Piazza is one of the main squares in Florence and marks the centre of the city since Roman times. Our apartment is in the building on the far left – the door is open. How great is this – but wait let’s not speak too soon we haven’t seen the apartment yet. For future reference the restaurant for tonight’s dinner is in the corner on the far right – near the white lights. Through the heavy wooden locked security door – Frederico tells Kylie and me to leave our bags at the bottom of the stairs – he will take them up for us and here we are – we unlock the door and it is brilliant. Down a little hallway that has a big bathroom on the right – the hallway opens into two bedrooms and a kitchen/dining area. This is a photo of my bedroom area. On the other side of the display shelving is K&T’s bed. Yep, it is brilliant. Frederico, or as I come to call him Agador Spartacus (from one of my favourite movies – The Birdcage) as he is so effervescent – arrives with our suitcases and stays to explain the wifi setup for which we are so grateful. He also gives us a map and shows us where their office is and where we are to get our breakfast in the morning which is included in our room tariff. He also highlights some of the best places to see and then wishes us a pleasant stay and leaves. We are so excited with the apartment and to be so close to everything well, it is just the best. The Piazza della Repubblica. 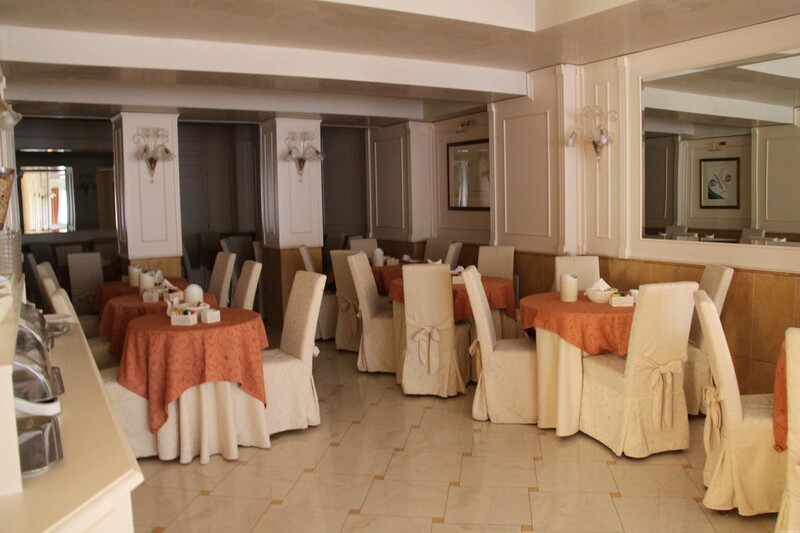 The restaurants are now all decked up for the night feeding frenzy and the atmosphere is great. There is a group of musicians playing and a carousel as you can see. Even at this late hour – about 8.30pm – there are still lots of families out and about enjoying the night air. 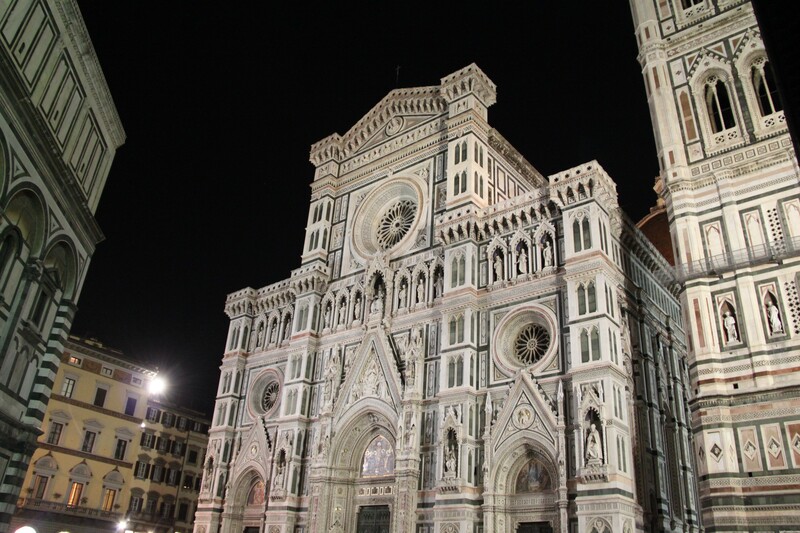 Even though we are hungry we decide to walk to The Duomo which is not very far and mainly to just get our muscles working before settling down to dinner and then sleep. The marble is pink and green – a lot of people don’t like it – but I think it looks outstanding. 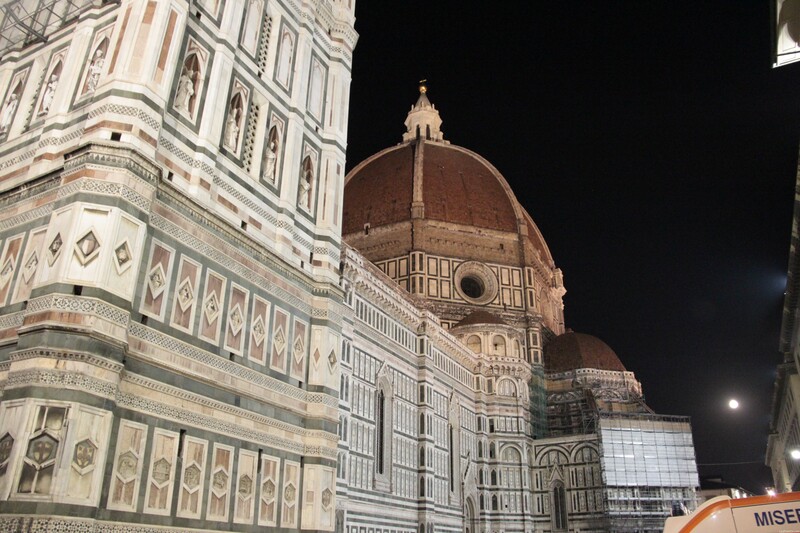 Topped with Brunelleschi’s Dome – it certainly is one of the most majestic icons of Florence. 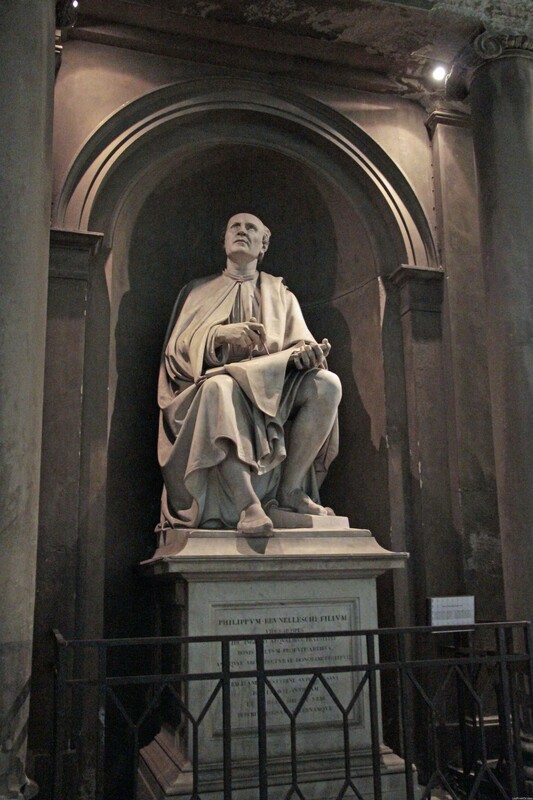 We continue walking around and getting some great night photos and I am glad that we came across this statue of Brunelleschi who was the engineer of the magnificent dome on the Duomo. His statue is strategically placed so that he is forever gazing upon his beloved dome. But our tummies are starting to rumble and we decide to head back to the Piazza to find a place for dinner. The restaurants around the edges of the Piazza are all vying for custom – we go to one place only to be enticed to try another place and back and forth. It is great fun and done with such humour – we choose one and find a seat on the edge of the seating area. We order some wine and I order a salad to start and then a Margherita Pizza. The salad arrives and it is huge – wonderful but huge and it takes a while to get through it. 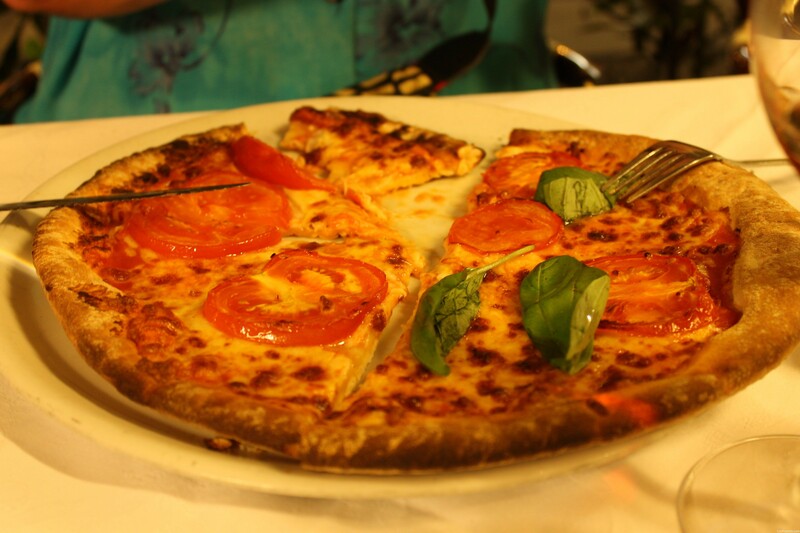 Next is the pizza- well you cannot come to Italy and not eat pizza can you? It is also delicious but too big for one sitting so the remainder is taken back to the apartment for late night feeding or breakfast – whichever comes first. We have a full day tomorrow in which we will experience this magnificent city and her treasures but for now we force ourselves upstairs and into the quiet comfort of our beds.